If you have not installed and configured omni yet, please follow ​these instructions. We are going to use the graphical interface of the portal (Jacks) to create the RSpec file for this tutorial but we are going to use Omni for reserving the resources. 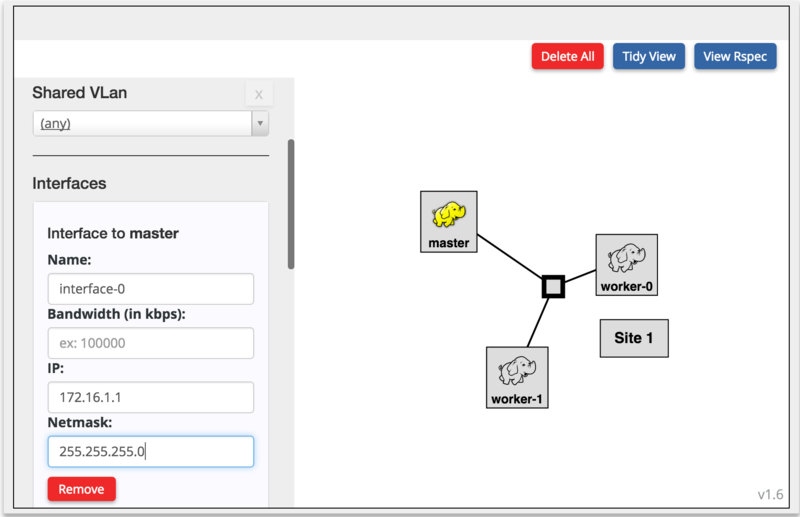 After you click Select, a couple of nodes will appear. 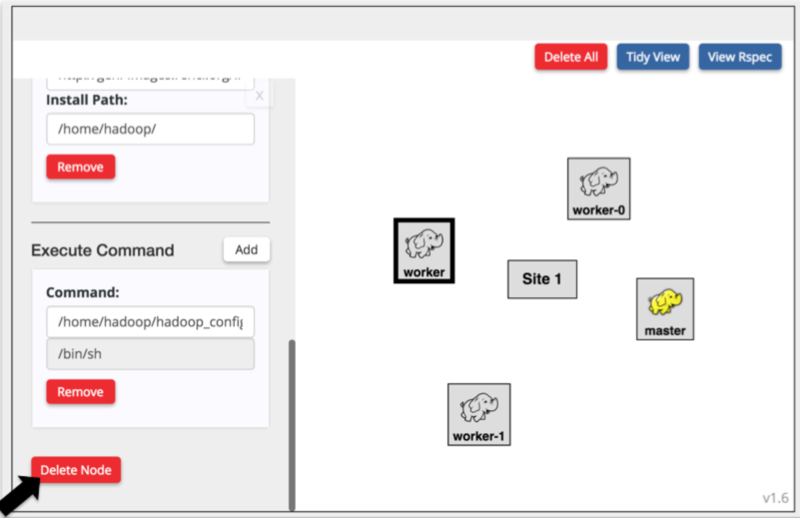 Inspect the properties of the hadoop master. Note that not only the usual attributes (e.g. node name, node type) are set, but there are also custom OS Image, install and execute attributes. These attributes is what customizes a generic GENI node a specialized one like a hadoop master. Press the "Duplicate Nodes only" button. 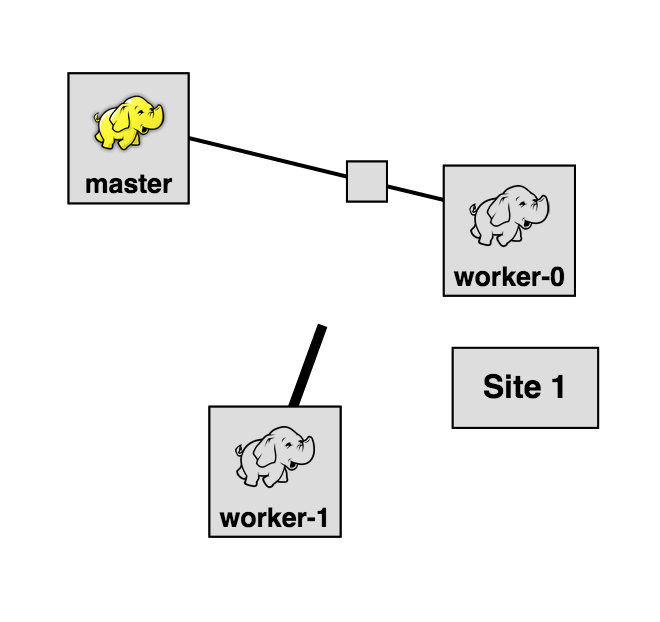 Repeat the above two steps so that you have at least three workers but no more than six (please be respectful to other and limit your cluster size, especially if you are doing this in the context of a tutorial). 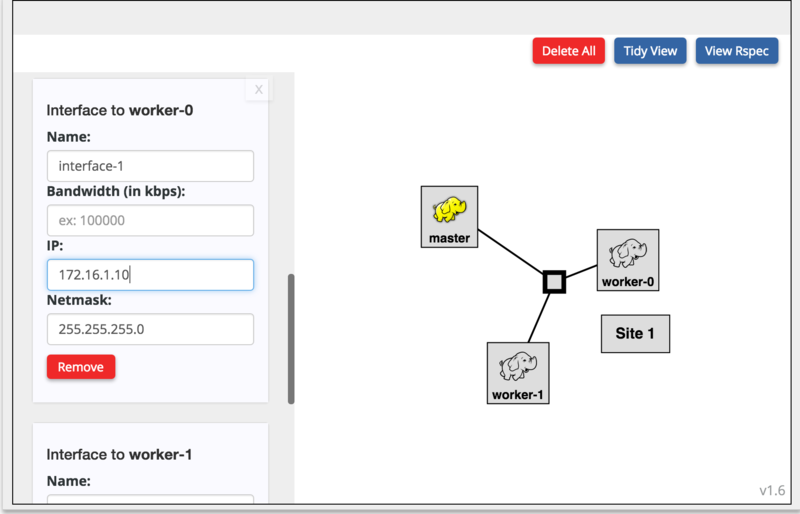 Delete the original worker node (select it and on the attributes on the left click the Delete button). DO NOT press the delete/backspace key since this is equivalent to pressing the Back button on the browser. WARNING: Make sure the IPs are assigned according to the above pattern, your cluster will not be configured correctly otherwise. Inspect your topology to ensure that all the configurations are correct and Download your rspec. where AM_NICKNAME is the nickname for your assigned aggregate manager, SLICENAME is the name of the slice you created earlier and RSPEC_FILE is the filename of the RSpec you just saved. You can tell whether your nodes are ready by using a script built on omni called readyToLogin.